Karl Ammann, in Beijing to show a new documentary on China’s involvement in the illegal trade in chimpanzees, is blunt: “China is the biggest destination for illegally traded chimpanzees.” Almost all chimpanzees performing in Chinese zoos have been obtained illegally, he says. Ammann, a 66-year-old Swiss wildlife photographer who once said “the lens is my weapon”, was in 2007 named as a Time magazine Hero of the Environment. He first published images of illegal wildlife smuggling in publications including the New York Times and National Geographic 20 years ago – showing readers around the world the truth of the bloody trade. YD: Your mission for this trip to China is to highlight the illegal trade in chimpanzees, something you’ve been tracking for years. How bad is it? Karl Ammann (KA): I started to pay attention to chimpanzees when I noticed that in the forests of Africa they are eaten by the locals. To an extent the illegal trade in chimpanzees is a byproduct of that. The hunters kill the adult chimpanzees for their meat, then sell off the young. It was about seven or eight years ago that the trade first came to my attention. A woman in Egypt was buying young chimpanzees from Guinea and Cameroon then selling them on to private zoos in the Middle East. She had contacted hunters from all over Africa, asking them to catch male baby chimpanzees. And I made a documentary about this animal trader. YD: Which of the two problems is currently worse – hunting for bushmeat or for export? KA: In terms of numbers, more chimpanzees are killed for food. Actually you need to kill dozens of adult chimpanzees before you get one baby. Because they live in troops, and the only way to get the babies is to kill all the adults. YD: Why is the trade only in baby chimpanzees? KA: Only the young can be taught to perform. Adults are very difficult to train. YD: When did the global smuggling of chimpanzees begin? KA: Guinea used to sell wild birds to Europe, and that was very profitable. But seven or eight years ago, after the bird flu scare, Europe banned the import of wild birds and the market dried up. And so the people in Guinea who’d been involved in that trade had to look for an alternative. They found there was a huge demand in China for live chimpanzees, and so the bird-catchers became chimpanzee-hunters. In late 2010 I met an animal trader in Johannesburg. He told me there was a big trade in chimpanzees in Guinea and that I should take a look. When I got there I found many chimpanzees were being smuggled to China. YD: How many have been sold to China? KA: An official conference put the figure at around 135. There were also 15 orangutans, 7 from the Philippines and 8 from Indonesia. And 10 gorillas, sent to China from places such as the Ivory Coast. Those figures allow us to be sure that China is the major destination for illegally traded chimpanzees, with the others going to the Middle East and Russia. China is an emerging market, and is opening more and more wildlife parks. There’s a huge demand for elephants and chimpanzees. YD: What has happened to those chimpanzees now? KA: I visited six or seven zoos in China, and my assistant went to others. 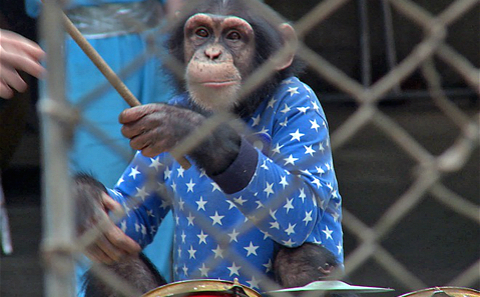 Everywhere we went we saw chimpanzees either locked in cages or performing on stage. There were even groups of chimpanzees locked up in a single cage. China doesn’t have experts on raising chimpanzees – you can’t put them together like that, as they come from different troops. They’ll kill each other. Chimpanzees are really suffering in China. YD: How did they get to China? Who profits along the way? KA: According to the Convention on International Trade in Endangered Species of Wild Fauna and Flora (CITES), endangered species may not be imported. Because of that treaty, zoos that want a chimpanzee generally borrow one. So members of the US Association of Zoos and Aquariums or the European Association of Zoos and Aquaria would rent a chimpanzee from another member for exhibition or breeding. And there are strict regulations: the first generation of animals bred in captivity may not be loaned out, only the second. But nations outside of the zoo associations have to buy chimpanzees caught in the wild to boost breeding populations. If you trace it back, it might not actually be Chinese zoos that initiated the purchase. The Chinese companies that import wild animals have certainly had long-standing links with animal traders in Guinea. Those traders say “Hey, we’ve got chimpanzees, want some?” So someone goes to a zoo and asks if they want chimpanzees. And of course they do, because they can use the chimpanzees to perform and make more money. Then the animal trader asks the CITES office in Guinea if they can export chimpanzees and of course the answer is no, as the country doesn’t have any captive chimpanzees. But in Africa you hand over a bit of money and report the animal as having being raised in captivity. YD: It sounds like it’s all pretty easy. KA: In Africa people can both supply you and give you the export licence. In China the importer pays to get an import licence, then they just have to get a certain number of buyers together and put in an order to the seller in Africa. And in China there are companies that manage the imports – they take care of the entire importation process. YD: Are the Chinese authorities aware of this? KA: If CITES rules were strictly enforced it would be very easy to uncover the illegal trade. CITES has a list of approved breeders, of what animals can be bred and by which bodies, and that’s all online. China only started to import chimpanzees in 2007, so it would have been easy to check that. Guinea has no CITES-approved breeder. So any imports from there simply cannot have been bred in captivity, much less be the second generation. YD: Have you reported this to the Chinese authorities? KA: At many international conferences I’ve asked officials from China’s office for the import and export of endangered species about this face to face: there are obvious errors on the import documents, are you really not aware of this? Just check online and you know right away something’s wrong: the export company doesn’t exist, or the country isn’t able to breed the animals. There have been cases where licences to import four tortoises to the UK have been changed to four elephants; or a permit for 5,000 parrots was altered to read 5,000 elephants, without even changing the number. The officials just gave us a statement in Chinese saying that all the information China has comes from the exporter in Guinea, and they accept whatever they are given. So there hadn’t been any mistakes on the Chinese side. If there were any mistakes, they were made in Guinea. It's disappointing to see racist articles like this blaming Chinese people for a global problem. The part where it blames powerless black people for the problems originally caused by whites is just a bonus.